Canton, Mich., Jan. 27 /CSRwire/ - IKEA, the world’s leading home furnishings retailer, today officially plugged-in an expanded solar energy array atop its Detroit-area store that opened nine years ago in Canton, MI. The 40,000-square-foot solar panel addition consists of a 242.1-kW system built with 781 panels, and will produce 293,502 kWh more electricity annually for the store. This solar expansion sits atop a 44,000-s.f. store extension completed this past spring. Now, IKEA Canton’s total 1,219.7-kW solar installation of 4,941 panels will generate 1,408,445 kWh of clean electricity yearly, the equivalent of reducing 971 tons of carbon dioxide (CO2), eliminating the emissions of 204 cars or powering 134 homes (calculating clean energy equivalents at www.epa.gov/cleanenergy/energy-resources/calculator.html). For the development, design and installation of this store’s enhanced solar power system, IKEA selected Inovateus Solar LLC, an industry-leading solar power distributor and integrator specializing in large-scale solar installations. Expanding this array contributes to the IKEA solar presence at nearly 90% of its U.S. locations with a total generation goal of 40 MW. IKEA owns and operates each of its solar PV energy systems atop its buildings – as opposed to a solar lease or PPA (power purchase agreement) – and globally has allocated $1.9 billion to invest in renewable energy through 2015, reinforcing its confidence and investment in solar photovoltaic technology. Consistent with the goal of being energy independent by 2020, IKEA has installed more than 700,000 solar panels on buildings across the world and owns approximately 300 wind turbines, including 104 in the U.S. Other IKEA rooftop arrays have been expanded too, when the store beneath was extended. IKEA, drawing from its Swedish heritage and respect of nature, aims to minimize impacts on the environment. Globally, IKEA evaluates locations regularly for conservation opportunities, integrates innovative materials into product design, works to maintain sustainable resources, and flat-packs goods for efficient distribution. Specific U.S. efforts include: recycling waste material; incorporating energy-efficient HVAC and lighting systems, recycled construction materials, skylights in warehouse areas, and water-conserving restrooms. Operationally, IKEA does not use plastic bags in the check-out process, sells only L.E.D. lighting products (fixtures, lamps and bulbs), and has installed EV charging stations at 13 stores, with plans for more locations. Located on approximately 30 acres along Ford Road off I-275 at Haggerty Road, the 355,000-square-foot IKEA Canton opened in June 2006. In addition to 10,000 exclusively designed items, the store presents 52 different room-settings, three model home interiors, a supervised children’s play area, and a 300-seat restaurant serving Swedish specialties, as well as American dishes. Other family-friendly features include a Children’s IKEA area in the Showroom, baby care rooms, play areas throughout the store, and preferred parking. 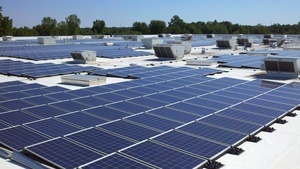 IKEA also installed Michigan’s largest solar array atop the roof of the store originally in 2012. Since its 1943 founding in Sweden, IKEA has offered home furnishings of good design and function at low prices so the majority of people can afford them. There are currently more than 370 IKEA stores in 47 countries, including 41 in the U.S. IKEA incorporates sustainability into day-to-day business and supports initiatives that benefit children and the environment. For more information see IKEA-USA.com, @IKEAUSA, @IKEAUSANews, or IKEAUSA on Facebook, YouTube, Instagram and Pinterest.